Behind most successful programmes there is a team of people with the necessary experience to help and guide you, and StartPad is no different. StartPad launched in June 2016 by successful entrepreneurs Fay Easton and Chris Haycock. Between them they have decades of experience in planning, launching and managing successful businesses. Some by themselves, others as part of a bigger team of founders. 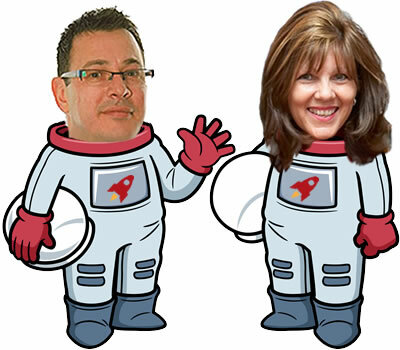 Over the years Fay and Chris have accumulated a wide range of business skills. They're willing to share everything they know about starting a new business, and they did so by building StartPad for YOU. Find out more about Fay and Chris below. After a short, 5-year career in the Royal Navy, Chris spent several years in hotel and restaurant management, before acknowledging that business was his real passion. Before moving into self-employment, he spent time working as Online Marketing Manager with dynamic dot-com companies, gaining valuable knowledge of the then blossoming world wide web. In 2010, after building and running popular entertainments listings guide, BritEvents, he started digital publishing company, CliqTo, and now owns a portfolio of dozens of internet properties, which in 2015 were visited by more than 1 in 7 of the UK population. Fay began her entrepreneurial career in leafy Shropshire, launching and trading owner-operated restaurants in Telford, Ironbridge, Newport and Shrewsbury. In 2001 she became Town Centre Manager for Shrewsbury, moving on in 2005 to become Projects Director with Shropshire Enterprise Partnership. Fay combines hospitality and business by founding Business Hubs as well as delivering Start Up Boot Camps and co-funded programmes focusing on youth entrepreneurship..
Fay is one of twelve Enterprise Champions that represent the startup community at Enterprise Nation.